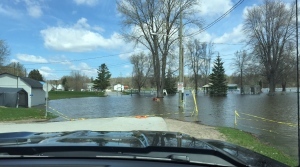 It’s become an all-too-common problem on lakes and rivers across Eastern Ontario and West Quebec, waterfront property owners watching their property disappear in some of the worst flooding in recent memory. “Yeah, this morning the steps to my deck, the whole front part here just floated away. I went fishing for my deck and the dock," says Pierre Voisine who lives on Voisine Road in Rockland Ontario. The road, named for his grandfather, runs along the Ottawa River. By Wednesday the entire road was under several feet of water. Some homes already had Ottawa River water lapping at their foundations. With more rain on the way, homeowners were frantically sandbagging their properties. And that’s when the second flood hit this tiny street. A flood of volunteers, many of them total strangers, descended on Voisine Road to help out in any way they could. Some business owners brought heavy machinery. Others brought food and drinks by the boxful. There had been no call for aid. Many had simply heard about the crisis on social media. 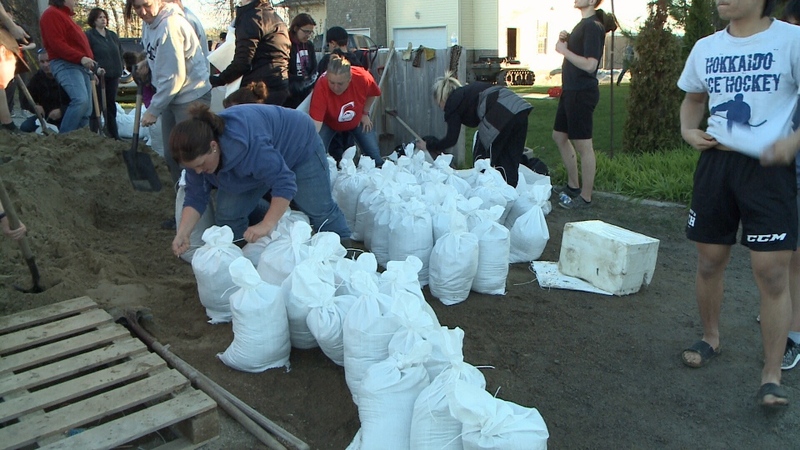 By Wednesday evening, dozens of volunteers were filling sandbags by the thousands, as fast as city trucks could bring the sand. The bags, and many of the workers, were loaded into the front end loaders of large tractors and ferried down the flooded road to the stranded houses. “And this is big. Because this morning we were using old boats to carry those sandbags," says Lavergne. They came from all walks of life. Jake Jurgeneit of Simcoe, Ontario was one of dozens of young students who bused over from the nearby Canadian International Hockey Academy. “It’s just great to see the community come together and just doing something to help out,” he says. The local Scout troop was also there lending a hand, coincidently during their annual National Good Turn Week. “I guess this is a great good turn for one day,” says scout Nathan Gillis. For the beleaguered residents battling rising flood waters, it was a much-needed lift to their spirits. Said Pierre Voisine “It's unexpected and it's really nice to see. It puts a little sunshine in a pretty rainy day."